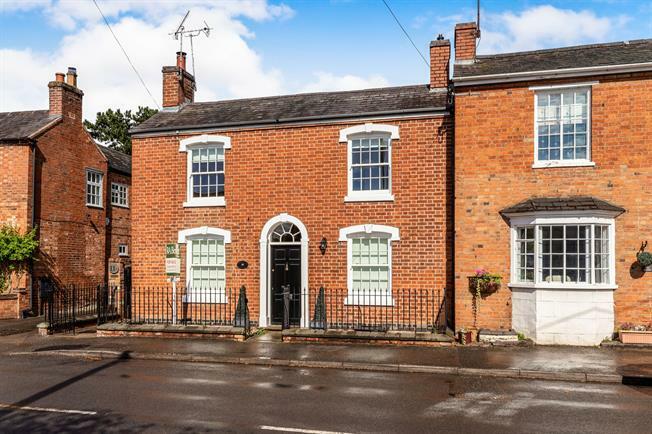 3 Bedroom Semi Detached Cottage For Sale in Warwick for Guide Price £550,000. Set in the sought after village of Barford is this three double bedroom cottage offering three reception rooms and a conservatory as well as a private courtyard garden to the rear, integral garage and handy cellar, the cottage briefly comprises; entrance hallway, large lounge, sitting room, dining room, WC, kitchen, conservatory, three double bedrooms, family bathroom, integral garage and cellar. Front door with decretive feature arched window overhead. Quarry tiled floor with inset coir mat and ceiling light. Newly fitted custom made single glazed sash windows to the front of the property and a French doors set into a bay to the rear opening onto the courtyard garden. Projecting chimney breast with an attractive marble surround and slate hearth. Radiator and wall lights. Newly fitted custom handmade sash windows to the front. Radiator and spotlights. Low level WC and wall-mounted sink. Single glazed Velux window. Radiator, tiled flooring and ceiling light. French door to the rear opening onto the garden. Radiator and ceiling light. A range of built-in and wall and base units with wooden butcher block work surfaces over. Inset Stainless steel sink with mixer tap and drainer, integral oven and hob with extractor fan overhead. Built in Aga oven, with extractor, space for dishwasher. Terracotta tiled flooring and part tiled walls. Recessed lighting. Dwarf brick wall with double glazed conservatory over. Wooden French double glazed door opening onto the garden. Radiator, tiled flooring and ceiling light. Access to the garage. Double bedroom with built in wardrobes with single glazed wood window facing the rear overlooking the garden. Radiator and ceiling light. Double bedroom with built-in storage cupboard/wardrobe and single glazed wood window. Radiator and ceiling light. White three piece suite with low level WC, panelled bath with mixer tap and shower overhead, pedestal sink with mixer tap. Part tiled walls and vinyl flooring. Double glazed wood window with patterned glass. Heated towel rail and recessed lighting. Double bedroom with built-in storage cupboard. Newly fitted handmade custom window. Radiator and ceiling light. Single garage with remote control electric roller door. Single glazed wood Velux window. A range of built in wall and base units with inset stainless steel sink with drainer and mixer tap. Ceiling light. A private courtyard garden with with brick wall surrounding three sides. Raised flower beds, mature trees and access the the front of the property via a secure gate. Comprising one chamber with electric and power. Dimplex combination gas fired boiler.